Five years ago, blogger Tiffany Aliche was saddled with $55,000 in graduate student loans, $40,000 in credit card debt and $200,000 from a defaulted mortgage. 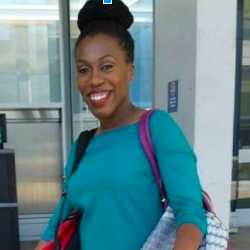 She paid down $260,000 of that debt and is now a financial educator, author and owner of The Budgetnista, a blog aimed at providing women with financial guidance. Here’s her story, related to us via email. By making financial lifestyle changes, Tiffany Aliche, aka The Budgetnista, lowered her debt from almost $300,000 to $40,000. She is now able to travel and is less stressed. Tiffany Aliche: Five years ago, almost $300,000 total. $40,000 in student loans from grad school. I was a victim of a scam that left me $35,000 in credit card debt. I also lost my job during the recession and was unable to pay my mortgage, so I defaulted and eventually lost the home due to foreclosure. I had to move back home, back to my middle school bedroom. It was a humbling experience. It forced me to re-evaluate my life and take action toward a better one. I stopped using my credit cards and only used cash. I used the snowball method to [pay] off my credit cards. I gave up my home and enrolled in a repayment program for my student loans. I travel, I’m less stressed and make better choices for myself. I also used my experience to build a business to help other women do the same. Like Aliche, you might have multiple debt sources. The snowball method Aliche mentioned, in which she paid off her lowest debt amount first, is best for people who need to achieve short-term goals as motivation. But paying off your highest-interest debts first — the debt avalanche method — will save you the most on interest over time and erase debt even faster. Your payoff plan should throw extra cash at debts such as high-interest credit card debt and allow you to make regular payments on your tax-deductible and lower-rate mortgage loan or student loans. Once you’ve prioritized your debts, make your monthly payments easier to handle. You can use debt consolidation to roll several high-interest debts into one with a lower interest rate. Consider a 0% balance-transfer credit card or a personal loan as consolidation options. Use a personal loans calculator to see sample interest rates and possible monthly payment amounts.